Snow is beautiful. It can also create stress. I’m listening to an interesting book called Brain Rules by John Medina. One of the chapters deals with the effects of stress on the brain. Short version: it’s generally not good! And while I was tromping through the white, fluffy stuff with my dog—we’ve had about a foot of new snowfall every Sunday like clockwork for the last three weekends—I realized that the snow has gone from something neat and fun, to a stressor. Why? Because one key cause of stress is the feeling that you have no control over the situation. After the first storm, we were fine. We cleared the snow into the yard, building a nice mound. After the second storm, we had to get more creative with our piles, but it still worked. The third storm last weekend broke us. Our yard is so full of snow that we have no more room to clear the driveway. The piles are so tall that when I try to add new snow to them, it just rolls back down. The cities are using “snow farms” to collect snow that’s being cleared from the streets and parking lots, but I don’t have that option. If we still lived in a house with a nice big yard like we had in Virginia, we’d be fine. But in Massachusetts we’re living in a quadriplex (kind of like a townhome) with a very small front yard that we share with our neighbor. We have about two feet of space between our driveway and that of the neighbor on the other side of us, so if we shovel to that side we’ll block their driveway. My husband’s car is now stuck in the garage behind a mound of snow because I moved it from my side of the driveway to his while he was out of town. In my defense, he told me to. 😉 Not ideal at all, but I had to be able to leave the house. When we had the space to deal with it, the snow was fun. It’s pretty, and it’s been exciting to see so much pile up. But now that we’re quite literally out of room, I hear that another big storm is coming this weekend and I want to cry. But, hey, it’ll make for a memorable first winter in Boston, right? I’m already trying to look back and laugh. I will as soon as the tears stop. Ha, let’s hope so Susan! The sun is out today, so even though it’s in the teens here, things are dripping. You know, so they can freeze into sheets of ice overnight. 😉 I was able to carve out enough space on my husband’s side of the driveway that he can back out. Feeling better. Thanks! I definitely understand how you feel. 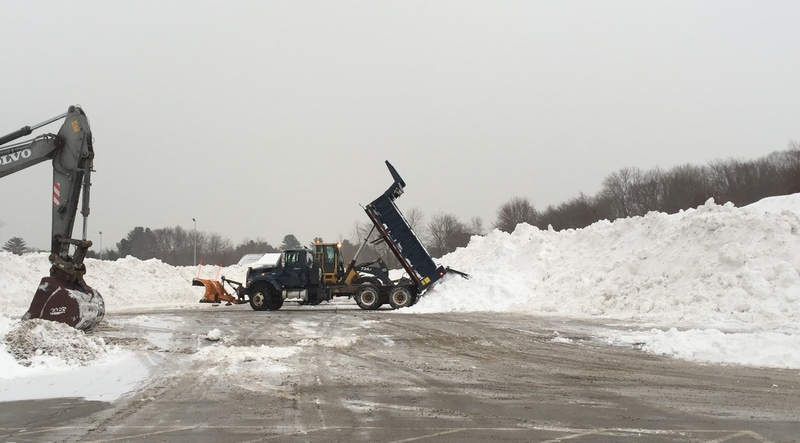 I wonder if you can rent a dumpster, then hire someone with a front-end loader or similar to dump all that snow into the dumpster? Which then gets trucked away? 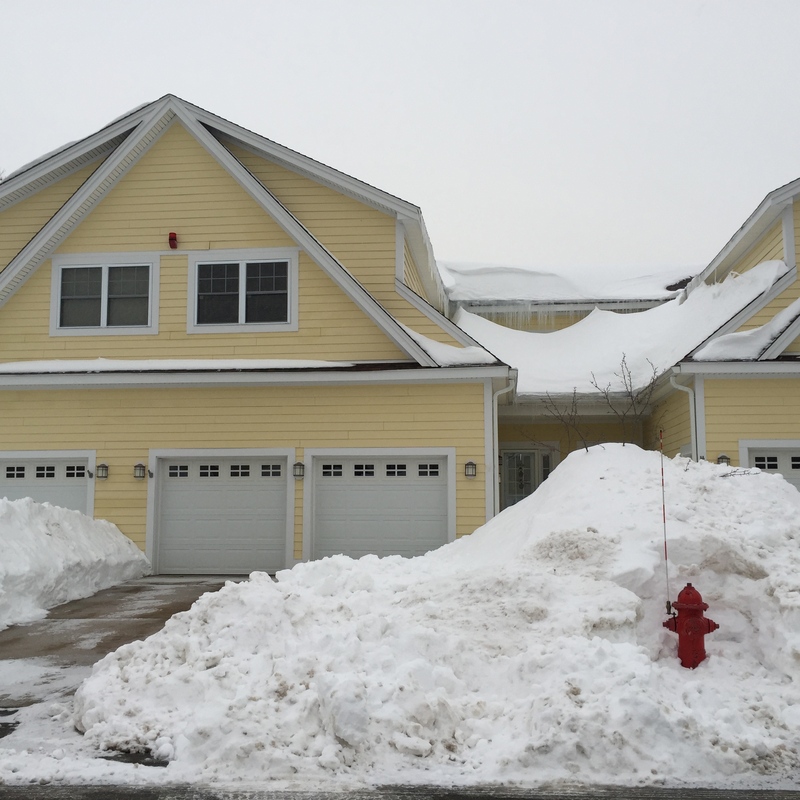 You might be able to work out a deal with your neighbors to share costs and get their snow cleared away too. There must be a lot of folks with tractors and bucket lifts who will be happy to remove your snow for a price. And yes, warmer weather is coming soon. I do wish we can have a bit of snow here in Maryland. Hi Gwen, I leaved under snow almost all my winters until I retired. I can understand how you feel. Fun the first storm but it should stop there. Now you understand why we choose to spend the winter in Florida ! One thing that is good about snow, it eventually melt ! Just to encourage you, in Montréal the very cold last up to the 20th of April. Lison: Yes, it’s fun the first storm or two. And it’s still beautiful when the sun comes out, like today. But we’ll definitely be heading for milder weather in a couple years. Thanks! Surely a novelist can draw on the experience of nature having the upper hand! And fascinating that you made the move between the two states with the original English colonies. On the New England Puritans (in comparison to the Chesapeake settlers) historian Alan Taylor writes “This different set of colonists adapted to a colder, less abundant, but far healthier environment. A northern and hilly land of dense forests, sharp slopes, stony soils, and a short growing season, New England demanded hard labor to make a farm and offered little prospect of getting rich. A critic insisted that in New England, ‘the air of the country is sharp, the rocks many, the trees innumerable, the grass little, the winter cold, the summer hot, the gnats in summer biting, [and] the wolves at midnight howling.” (Taylor 2002, American Colonies: The Settling of North America, p. 159). I love that description and quote it often! I’m not certain if the Massachusetts climate was any healthier than the Maryland one in the 1600s, or vice versa. The intense cold during the New England winters likely killed a lot of settlers from starvation and exposure. The sea perhaps provided an easy source of fish, but further inland you needed to hunt wildlife, lay in stocks of firewood, and hope you would not starve. I heartily agree with the “stony soils” assertion by Taylor. Rocks are your most abundant crop on a Massachusetts farm. The early settlers in Canada are a special case. They must have had enormous courage to venture north and east, and north and west. I am not an expert on the conditions that early settlers faced. I’m using my imagination and my belly here. As I write this I realize I would like to know more about the challenges that faced them. I’m sure that for the early settlers who came to Canada and America, it was very much a case of survival of the fittest. I believe the communities realized they also needed to be able to support an artisan class whose members could not spend all their time farming and hunting: specifically, blacksmiths, leather makers, carpenters, glass blowers, and other specialists whose products would be needed by everyone. I’m just guessing, but I think communities must have actively helped their artisans to get established, to have sufficient housing, food, and warmth to survive the worst weather events. Defintely, Joyce! I’m already imagining all sorts of snowed-in scenarios. 😉 It’s interesting about moving from VA to MA. Virginia is still very steeped in its southern history, and the Civil War (with the exception of Williamsburg/Jamestown). Massachusetts is all about the Revolutionary War. Both are fascinating from a history standpoint. For a girl who spent most of her youth in the western U.S. or out of the country, having all of these historical sites so close is very cool. Thanks for sharing! Massachusetts may be more about the Industrial Revolution and the many waterways that made it possible for the Commonwealth to become a force in textile production at one time. Massachusetts is certainly about immigrants who hoped to find better lives compared to what they experienced in “the old country”. You might want to give the Wikipedia article on Lowell, Massachusetts a skim. I still have memories of abandoned mills in southeastern Massachusetts and also of jewelry factories. I remain in respectful awe of my stepfather’s parents, who were themselves immigrants and worked very hard to build new lives for themselves in the strange, freezing cold climate that welcomed them. My grandmother’s parents were also immigrants, but they settled in Vermont. I discovered how fan, you americans are about your history the first time I visited Gettysburg’site. The Secession war (Civil war) is quite something to analyse running through all those sites, camp, museum. Talking to people who sometimes described histories coming from and old oncle that the father was a survivor has it occurs to us in Vickburgs, Mississippi. We love visiting and discovering the United States ! Lison, I would enjoy learning more Canadian history. The history of our neighbors is very important and I have ignored it for too long. I stayed in Montreal for a few days in 1996, and would like to explore Canada on foot some time in the future. I would like to walk from Maryland to some point close to the banks of the Fleuve Saint-Laurent (St. Lawrence River) and then decide whether to cross it and which direction to proceed in. It would be interesting to do this in winter. Maybe I can follow the footsteps of the very first settlers in Canada. Hi Bob, that is an interesting project to walk Canada. But Canada is big… it takes as much time to fly from Montréal to Vancouver as it takes to fly from Montreal to Paris ! But you know, people at the beginning were more using river that walk to discover. Lewis & Clark navigated mostly. With the great help of ‘Sacagawea’, they could finally reach the Pacific. We traveled through Canada also, from the beautiful Newfoundland (where I wanted to see the Viking site at ‘L’Anse aux Meadows’) to Vancouver with our small RV. I wish you good look with this very interesting project. I’m sure that writers such as Elyse Gasco and Erin Moure got plenty of writing time in while snowbound. Perhaps that can be a comfort to you. This problem, too, will pass. Stay warm! I have to say, it’s not usually *this* bad. That’s what I keep hearing, Laurie. 😉 Thanks and you too! There is hope. I keep up with bird sitings literally all over the world through Cornell University. So, I gave your location a look. Sure enough, Friday of last week, the 6th, two American Robins were sited in Boston Public Garden. They have been heading your way since the 1st of January. They’ve been coming through South GA in waves now. Won’t be long. Let me know when you see the first Robin when you get your yard back. Stay warm. I feel your pain, Gwen. We went through a similar winter here in CT a few years ago. The snow was never-ending. Those big storms you’ve been getting have just missed us so far this year. That seems to be how it goes. Most of the time you get snow in amounts you can deal with, but every few years some area of New England gets slammed. Hang in there! Spring will be here sooner than you think. Hugs! So it is snowing here in Maryland. The National Weather Service suggests we will get 4 to 8 inches of snow. 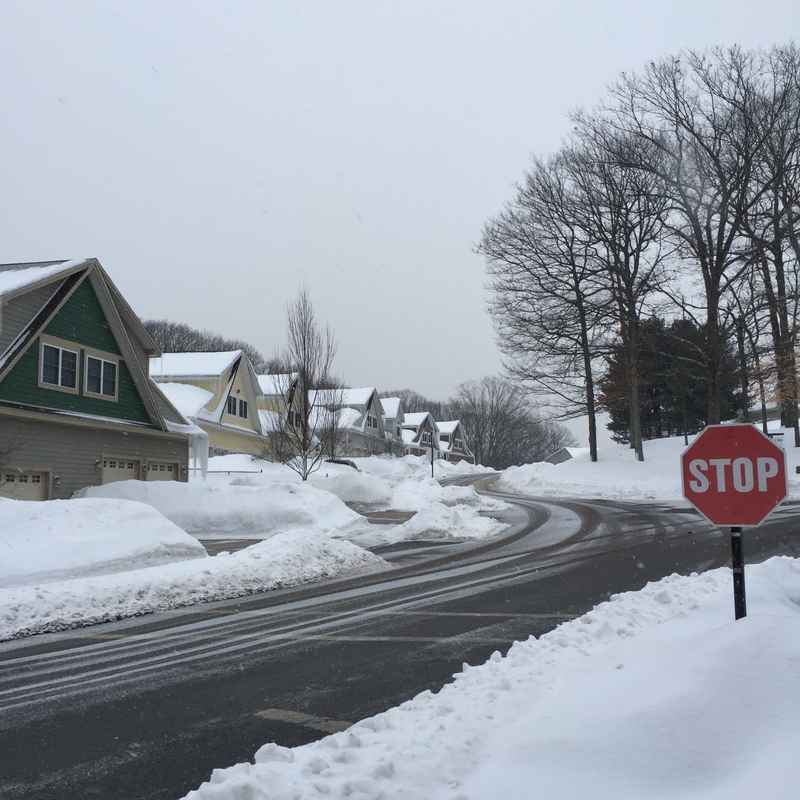 Generally, these seem to be worst-case estimates — we get much less snow than predicted. I will have to see if the Federal Government closes in this area in the morning. That will give me shovel time because I help my neighbors. It is not like getting the large snowfalls you folks are. Still, it is exciting especially after a weekend of low temperatures and high winds. I moved to Waltham in November 1977, just in time for the blizzard of 1978. The big difference was that it was one huge storm. This year you are getting blast after blast. Good luck figuring out where to tuck the snow. At least you have garages — those with only on-street parking have a whole different set of woes. Jim — I was in Washington, DC that year at college. We had snow related to the New England blizzard but not much, about 1 foot. I think school only shut down for 1 day. We students would put our cartons of milk and orange juice on the exterior windowsills of our dorm rooms, so they would stay cold. Back then I was very accustomed to frequent snows of more than a few inches at a time. Many times in the early to mid 1970s I would get up before dawn on a snow day and start shoveling neighbors out. Often it would still be snowing. So I guess the snowfalls that Massachusetts has now reminds me of the good old days. Bob — I grew up in the Rochester, NY area and so had some experience with snow. As a kid the great thing about snow was not only the occasional unexpected treat of no school, but that people would pay me big bucks (well, they were big to me at the time) to shovel their driveway. Of course, I had to do our own first. 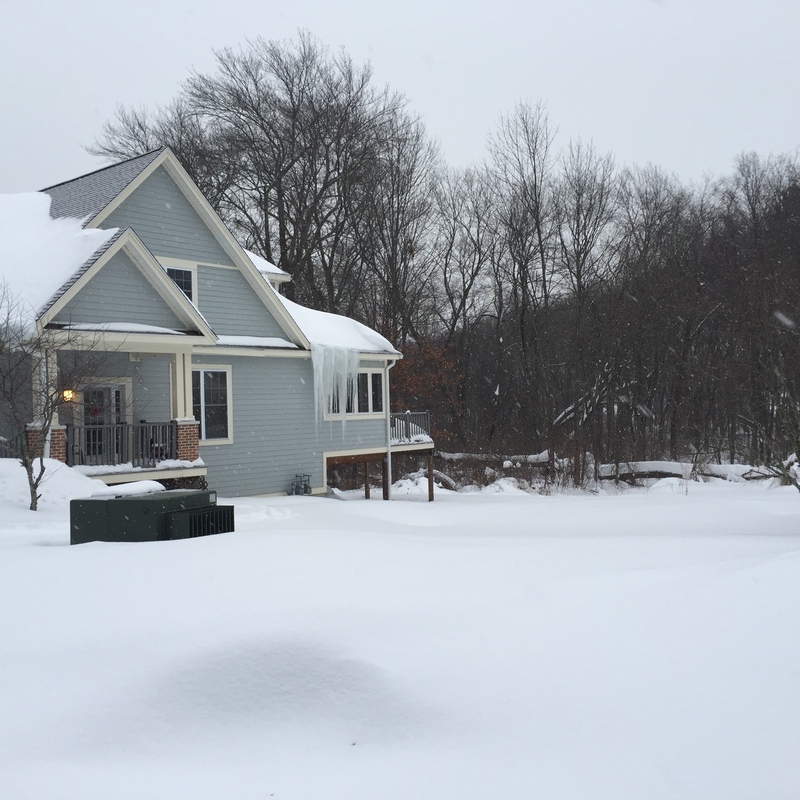 A friend of mine who works in Massachusetts says she and her family went away to Canada to get away from the snow in their home town. She says there is about 9 feet of snow and a lot of houses are having roof collapses from the snow and ice loading. She has skylights in her house, so they were able to access the roof and push snow and ice off it, at the cost of their BBQ grill which died under hundreds of pounds of ice. My heart goes out to you folks, I didn’t realize there is so much snow there.